Cohort Outtake: GMC Caballero Grande – World’s Longest Pickup? We looked at the GMC Caballero the other day, so how about we follow up with the Caballero Grande? Is this is the world’s longest ‘unibody’ (cab and bed integrated) ‘ute’? CC’er Teddy shot it and posted it at the Cohort, and it does make for some interesting speculation. especially in a relatively rainy locale like Oregon. Here’s a look into that long bed. Nicely done too. We’ll juts have to speculate as to why. I bet that has a 366 big block and Allison 545 auto…just like every other GM chassis schoolbus of the era. A surprising number had 8.2 diesel power…I saw one with, of all things, a 6V53 Detroit! I forgot about those miserable 8.2 diesels…..though not technically a “Screamin Jimmy” they were quite slow and noisy…in a very unpleasant way….. The actual Screamin Jimmy would have been far preferrable…with a “Drive it like you stole it” manual. Over time I’ve seen a couple of variations of this theme, used to haul firewood and watermelons. Considering the only other use for an old school bus is a circle track race, this does make more sense. And whoever did this performed rather well in amputating the roof. Or pinestraw (in the South). Retired school busses often get recycled as church busses, too. I’ve seen at least a couple with the back half of the roof cut off. Haul some workers out to the field in the covered part, and haul some produce back from the field in the uncovered part. Yep, I think that’s what this is. Down here, they’re popular for hauling tobacco in from the field. Love the ram air intakes above the windshield. Is the double letter L in Caballero pronounced as a Y or as an L like how Amarillo, TX is pronounced? I photographed this in Shamanism, WA if you want to get technical. That’s in Mexico. Mexican Spanish is pronounced much differently from classical Castillean Spanish. And don’t EVER confuse Mexican and Spanish food! The upside down rear door turned into a tailgate does have a neat feature with the rear window to help when backing into a tight space. Maybe it’s not upside down, I seem to somewhat remember old school buses may have had a rear window down low to the floor. The backup window in the lower part of the rear emergency exit appeared in the early-mid 1960s in many school buses. Where I went to school, the 1959 Chevrolet (348 V8, I was told…it was the hotrod of the fleet) and the 1961 Chevrolet (6-cyl., in a much shorter bus) school buses didn’t have them. The 1964 GMC (V6) and all the newer ones did. I’ve heard such things are used to haul watermelons. Indeed, chopped up school buses are a fairly common sight in agricultural areas. Often the top will be left in place with just the sides removed to allow easy access for stacking melons, etc. Most of the ones I’ve seen around here are not finished to this level, no one spends anymore time on them than is necessary to remove the excess metal. I would think the resulting structure would be pretty floppy but these aren’t likely driven very fast or for any great distance. Personally I would have left more cab maybe a crewcab style this would be great for getting my firewood bigger cab more helpers. Yup leave enough room for at least one row of seats if not two. I’ve seen a couple of buses converted in to car haulers by taking the sides down to floor level and making leaving enough for a row of seats behind the driver. Certainly would increase the usefulness of it. 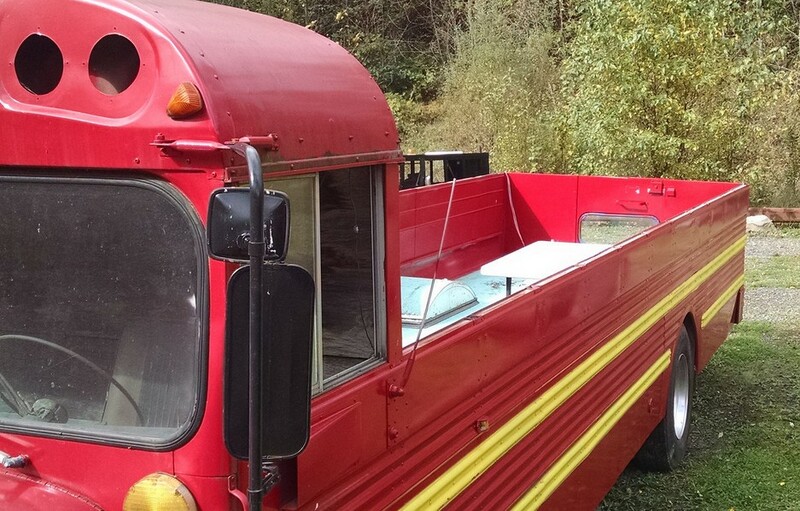 It’s hard to tell for sure, but given the original door is in place, appears to be functional, and is the only apparent way into the cab – my guess is that this bus-pickup only seats one (the driver). I saw one on the Power Tour a while back…it was a full-sized school bus chassis (I recall a circa-1990 International with DT466 power), with a mini-bus body on it. Behind the bus body was a long ramp, that held two cars. Pretty cool, actually! That’s a bit wasteful. I used to see a school busamino in Bend Oregon that was chopped at the second row of windows to make a large crew cab and had bed sides made out of chain link fencing to haul firewood.This was a few blocks from an Jeep Cherokee XJ that had also been turned into a crew cab. Children just learning to read would have fun pronouncing “Gmc”. The farm workers use these to harvest watermelons. One drives slowly, with a couple of workers catching and stacking the melons. The workers on the ground pitch the melons. I have to assume all involved develop arm and shoulder muscles galore and sleep well at night. 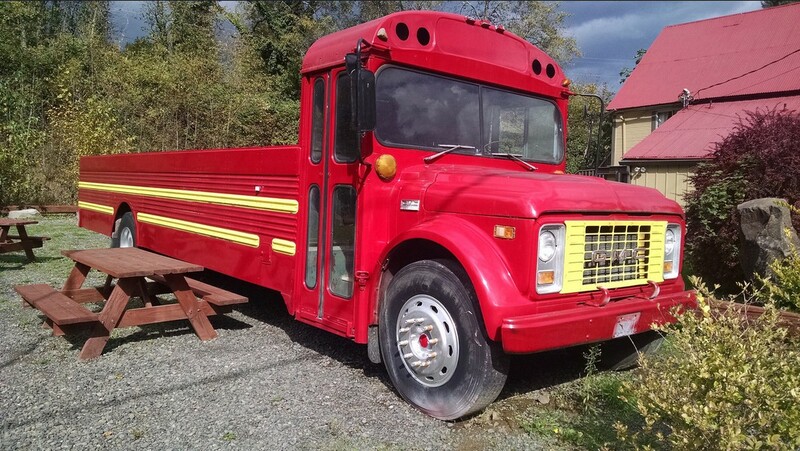 Used school buses are very cheap, so a purpose-built vehicle would never fly in the world of melons. “Mr. Majestyk” wouldn’t have been the same movie if Charles Bronson was driving this. The GMC V-6 was available in 305 and 351 V6 displacements on this model through at least 1973 or 74 with the 8 cylinders avail as well….The school district I belonged to had a fleet of GMC 6000 series buses that ranged from mid 60’s models up to 1973 models…..Older ones had the GMC 305 V6 while the newer ones had the 351….. I ‘ve seen this used around here by farmers to haul the large round bales of hay. years ago, when I worked for the taxman herein Canada, I had a guy in appealing an auditors decision to disallow his “farm truck” expenses. what he was doing was buying old hearses and doing similar mods. he said he could buy 3 or 4 hearses for much less than a new truck, and get 2 to 3 years out of them before the next one. As I remember he did get the decision reversed! Used to see lots of this sort of thing in the 1960’s & 1970’s, There was one I saw often that had been made into a Motor Home, the back 5′ or so was daylighted and built up as a porch with rocking chairs etc. School bus chassis’ are *much* sturdier than are Motor Homes ~ those are usually built on one ton chassis . And school buses have great brakes. On the Internationals the standard was to put the brake system from the next larger GVW range on chassis intended for being made into a school bus. So like an extra 1/2~1″ of shoe width and the next larger compressor and tank size. My Brother’s Cornbinder 88 passenger school bus had the twin circuit system that had dual hydraulic lines to each wheel . We took most of the seats out and used it as a camper and trailer hauler criss crossing America in ’88 ~ ’90 . Dragged my ’52 MG TD from Boston, Ma. to Sunny Southern California with it using a two axle trailer . Carpenter body, whats left of it.